Sandeep and Carolyn Sood own several apartment buildings in Chicago, but the 55-unit building at 6731 S. Jeffery Boulevard is special. The building is one of the first in the country to receive the new ENERGY STAR® certification for multifamily buildings. The Jeffery Parkway building earned the U.S. Environmental Protection Agency’s (EPA’s) certification, which signifies that the building performs in the top 25 percent of similar multifamily buildings nationwide for energy efficiency. The multifamily ENERGY STAR category is a new space type for the EPA. So far, 17 multifamily buildings have received the certification, including an additional two in Chicago at 680 N. Lake Shore Drive and River City at 800 S. Wells. “I’m extremely proud to be one of the first in the nation, and I think our tenants will be extremely proud, too,” Carolyn Sood said. Multifamily buildings receive an ENERGY STAR score of 1 to 100 accounting for the building’s energy use; buildings that score above 75 are eligible to apply for ENERGY STAR certification. Jeffery Parkway boasts an impressive score of 99, meaning that it performs better than 99 percent of similar buildings. The score helps building owners understand energy use relative to peer buildings. This provides a clear assessment of performance and enables owners to take steps to reduce wasted energy. Improving the energy efficiency of multifamily apartment buildings means lower energy use and costs, healthier communities, and cozier homes. Improving existing building stock also helps preserve affordable housing in our communities. To achieve an ENERGY STAR score of 99, the Jeffery Boulevard building, built in 1928, needed a little help first. Sandeep and Carolyn worked with Elevate Energy’s full-service energy efficient buildings program to retrofit the building, installing a new steam boiler and controls, replacing hot water heaters, and insulating heating pipes. Owners received a low-cost loan from Community Investment Corporation to help cover the cost of the improvements. They now expect 50 percent savings on natural gas, every year, and the improvements helped the building achieve the ENERGY STAR. The ENERGY STAR certification shows that even older buildings can perform at the highest levels. Tenants benefit from cozier, healthier homes, too. We look forward to seeing other multifamily buildings in Chicago achieve the ENERGY STAR certification, and we can help. Contact our buildings team at to schedule an energy assessment at your building: 855.372.8377 or . 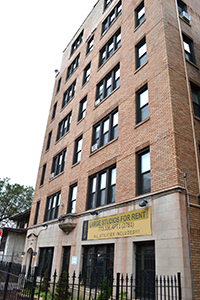 Click on the images below to see the improved building at 6731 S. Jeffery Boulevard.